With no options to select from, I ask the skinny looking guy who was also the owner of the rented jeep and motorbikes to give me the keys for the only Jeep in the shed. I fill him with my details and take the keys. As I turn on the ignition and press the clutch, in a brief second, my mind registers the reason for my being where I was. I see the passing coconut trees and try to absorb the greenery around me. I somehow have hope that this greenery would heal me. I pass by numerous modest homesteads, a bizzare ensemble of colors in vibrant foliage. Life is so slow here, so serene, so calm. The sound of Thunderbird engine brings me back to my senses. I quickly look towards my right and no more than 7-8 motorbikes rush past me. And did I just see a Harley? 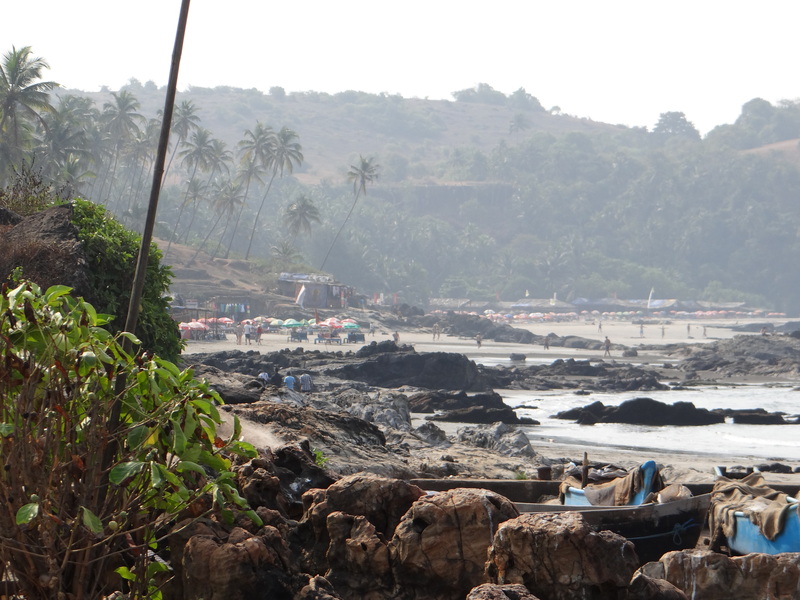 I suddenly remembered it was season for bike races and no more than a minute ago I had crossed Anjuna beach area. I briefly curse myself for not choosing a motorbike over my open Jeep, but then calm myself down as the North Goan breeze coolly sweeps over my forehead. The purpose of my vacation was not the adrenaline. By now the bikers are nowhere to be seen. My stomach backflips. I hadn’t eaten anything since morning except for few slices of toasted bread and some juice at my hotel. I see the navigation on my cellphone. Still 15 minutes for me to reach Panjim, where first I’ll have to get the tank refueled and find something good to eat. At a distance I can make out the bridge on Mandavi and few streamers and ferries on either sides. It is four in the evening, in few hours the bridge and river both would be covered in tiny pinpricks illuminating the river water and the city of Panjim alike. On the other side of this bridge, it is a new Goa altogether. I have a reason to miss and evade the city-lights at the same time. After crossing the bridge I pull over at the petrol pump. Weird images flash in my mind. I had never planned for this vacation alone. At least two months back I was intended to be with someone at this moment here, where on the other hand now I was contemplating everything all by myself. I stop by a makeshift diner and step in deciding something to eat. Looking at the menu is always a formality for me unless I am in a mood for experiments. I take a table towards the corner and fiddle with the menu card. I have to change. In the fork roads as these, I’ll have to change to be able to accept new things in life. I had never thought that this would happen. I decide on ordering something that I have never tasted (something authentic and local). As I start tapping the table unknowingly, the waiter turns up to take the order. He smiles and compliments me on the choice. Somehow I smile too. Partly to return the gesture and; partly to laugh at myself on my good choices. Yes, now I regret some of those difficult decisions. Throughout my time there this guy keeps me entertained with his smiles and gestures. Does he pity me for being alone in a place like Goa. Maybe this is how the world reacts when you are a guy in your late-twenties and half of your friends think that you could have had any girl you wanted. Having been finished my meal, I ask for check and tip the waiter and move out towards my Jeep. It is twilight now and the bridge, the city and the Mandavi are dazzling with lights. I am leaving a city behind and with it all the intricacies of my life and embracing the soothing serenity and calmness of solitude and with it embracing a new life in a hope that when I end my journey I’ll be able to change and change for better.